Home › CLI Updates › We graduated: What’s next? How the last week of the school year was the most anticipated? How you didn’t have to worry about doing homework? How you were excited about what the next year would bring and the wonder of what life after high school would be like? What jobs you would need to get? Or the pressure to help parents financially after all they did for you? Or how to you were going to pay for or find money to go to college? These are all the questions the TURNO cohort of 2014 had. Their school year ended yesterday, June 17. This year we have two freshman, two sophomores, ten juniors, and four exceptional seniors completing the program. Read about Senior Alfonzo’s art accomplishments here. 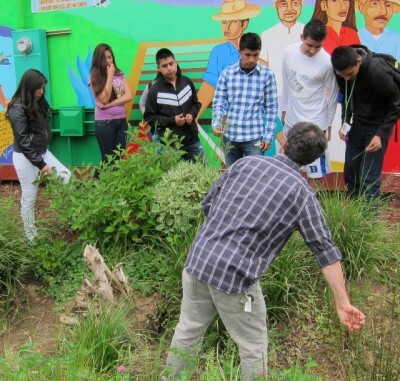 Volunteer Ian Niktab teaches TURNO students about the three types of grasses, and which we desire in our bioswales. Ian works with Planting Communities in Woodburn. These 21 young bright minds came through our doors less than a year ago. They’ve showed us how much more we have to learn from the young people in Woodburn, OR. The future of the program is bright with more than half of the participants coming back next year. And we are getting ready do it even better next year. This summer marks the first time we will be doing a summer program. Four of the current participants will be part of an eight week program where they will be working directly with our movement leaders and mentors. During the summer program the TURNO participants will be learning about movement building strategies and trainings, civic engagement, the power of radio, and how to recruit and retain volunteers. I will be happy to tell you more in person during our third anniversary party, August 9 from 4pm-7pm at CAPACES Leadership Institute in Woodburn. Hope to see you there.